The work will preserve the façade of the Reiss Building when the building is demolished to make way for housing units. But there will be some changes to the building’s exterior including enlarging the windows, including an entrance to an underground garage and adding decorative masonry, project documents showed. West Village Residences partner Bill Rudin said the 7-0 vote on the “adaptive reuse” of the brick and stone building was a positive step toward the redevelopment project in the Village. “Thanks to the efforts of the commission, City Council Speaker Christine Quinn, Mayor Bloomberg’s office, Community Board 2 and the community, we will now be able to adaptively reuse the entire 12th Street side of the former St. Vincent’s campus,” he said in a statement. 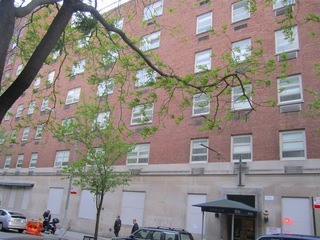 The West Village Residences’ initial plan was to demolish the Reiss Building, which was built for St. Vincent’s in 1953 and 1954. Preserving some of the building was one of several modifications Rudin agreed to in mid-March. Andrew Berman, the executive director of the Greenwich Village Society of Historic Preservation, said his group would have preferred to see the entire building, not just its façade, saved. “[The Reiss Building] is an integral part of the history of the West Village and the St. Vincent’s site,” he said. He said he feared for the integrity of the façade. “We are concerned that plans to demolish the entire interior of the building and parts of the façade may endanger the parts of the façade which are supposed to be preserved,” he said. Rudin Management chief operating officer John Gilbert assured locals at a recent community meeting that construction teams would make every effort to protect the façade, The Villager reported.